This 3D printed motorcycle is smaller, lighter, leaner, and *very* expensive. 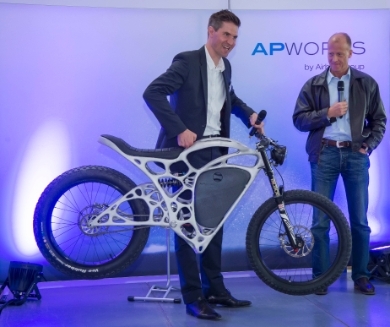 Airbus subsidiary APWorks just announced its creation of the world’s first fully-functional 3D printed motorcycle. Printed using APWorks’ patented materials and techniques, the motorcycle weighs only 35 kg. Nicknamed the “Light Rider,” this new design is certainly lightweight: it is 30% lighter than conventionally manufactured e-motorcycles, with a 6 kg frame and a small 6 kW electric motor powering it from zero to 80 km per hour in just seconds. The design makes full use of 3D printing technology. It has hollow frame parts instead of solid ones, allowing for integrated cables, pipes and screw-on points in the final structure. The printing system melts millions of aluminum alloy particles together creating thousands of thin layers just 60 microns thick. To make the Light Rider, the company used their own proprietary material, Scalmalloy, for the construction of the frame. Scalmalloy is a corrosion-resistant aluminum alloy that is virtually as strong as titanium, boasting high strength and ductility. Hoping to snag your own Light Rider? APWorks says they will only be producing 50 units and selling them for 50,000 euros each.